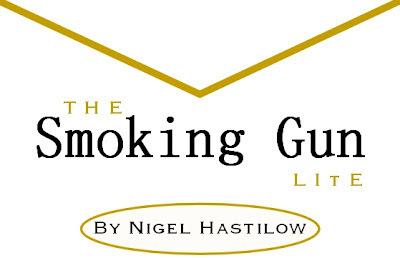 When I wrote my novel The Smoking Gun (see www.thesmokinggun.co.uk) I made up the idea of a total smoking ban imposed by a Coalition Government as a metaphor for the madness of the PC brigade. I didn't really think that's what we would come to within weeks of publication. Aren't we sick of being told what to do yet? It's a packaging ban today but soon enough it will be a total ban if Health Secretary Andrew Lansley gets his way. It seems he wants to reach the point where tobacco companies have "no business" in Britain. Well apart from the thousands of jobs that would be stubbed out and the massive increase in the already lucrative smuggling trade (20 per cent of all cigarettes sold and half all rolling tobacco has been smuggled into the country) there is a civil liberties aspect to all this. Not that anybody seems to give a flying whatever for such an out-moded concept. BBC Radio Edinburgh rings wanting me to take part in a debate on whether Scotland should have a nuclear deterrent. My reaction is to laugh out loud and tell them the whole idea is a joke. Suddenly they don’t want me on their programme any more. Which proves the Scotch take themselves too seriously and couldn’t survive independence, with or without their own nukes. It is not reasonable to assume millionaires need tax relief to turn them into “philanthropists”. If they want their knighthoods and public recognition, they should give their money away through genuine generosity and not because the Government turns it into another tax dodge. Why on earth would anyone invest in Facebook? It’s just a fading fad which has already had its day. Yet it’s about to be sold off for an astonishing $64 billion in one of the biggest con-tricks in history. The Tories are languishing in the polls as David Cameron struts the globe enjoying photo opps. I wouldn’t want to be a Conservative or Lib Dem councillor facing re-election next month. Labour candidates are lucky they can pretend Ed Miliband is nothing to do with them. At a time when this country is broke, why is George Osborne planning to bung another £10 billion to the dead-and-dying Eurozone via the IMF? Talk about money down the drain. Are mini-earthquakes a price worth paying for cheap gas? Probably the answer is yes – unless it’s your house that collapses. Should we demand that the candidates for Mayor of Birmingham – assuming there are any – must disclose their tax affairs? And, if so, should they also publish their spouse’s – because that’s how slimy hypocrite Ken Livingstone has avoided telling us the truth about how he minimises his tax bill? Meanwhile, Warwick University says there’s no point in elected city mayors. Will Brummies please take note? Should we really ban bank holidays to boost the economy? Certainly not – we all need the opportunity to spend hours in traffic and be ripped off at over-priced tourist attractions. If you want proof that high taxes lead to a cut in revenue look at the figures for smuggling alcohol, fags and petrol. The Government’s lost out on £30 billion of revenue because it’s trying to rip off the taxpayer. And I’m on the side of the smugglers. Amazing – the HS2 line won’t be built for years (if at all) but the gravy train has already left the station with 215 people on it and another 100 clambering aboard by the summer. All at our expense, of course, and all employed to make sure we don’t try and derail the whole wasteful scheme. The MI5 “body in the bag” inquest will be partly held in secret while the Government presses ahead with plans to impose more law behind closed doors. This is what happens in dictatorships. A bit of snow in Scotland in early April is another example of "extreme" weather, according to Jim Naughtie on Radio 4's "Today" programme this week. The subliminal message is that this sort of extremity is out of the ordinary and therefore a consequence of climate change, itself the result of global warming. The dry March and water shortages across half the country are supposed to be similar signs that the world's weather is out of joint because humankind is destroying its natural habitat by burning too many fossil fuels. Every time there is a change in the weather, especially a dramatic shift, we're led to believe that global waming is to blame. Yet March's drought was not the worst in the history of the universe ever. It was only the worst since 1957 when nobody had ever even heard of climate change. The water shortages in parts of the country are not an inevitale consequence of climate change and lower rainfall is only partly to blame. The shortages are a consequence of an increase in demand as well as a decrease in supply. More and more people live in London and the South East so water consumption is bound to be at record levels. In Milton Keynes they're banning baths in new houses and installing showers only, not because of climate change but simply because, in normal weather, the supply of water cannot keep pace with the demand. I recall driving to Scotland in lovely spring weather one early April in the 1980s. We stayed the night just north of the border in Moffat and woke up to thick snow. We struggled through blizzards all the way from Moffat to St Andrew's, passing several lorries and cars abandoned the night before. We made it but it wasn't much fun. That was "extreme" weather too. But Mr Naughtie would not have batted an eyelid 30 years ago. He's have just called it "weather". The word "extreme" only applies to serious freaks of nature not the variations and vicissitudes we have come to know and love over many years. Why is the weather Britain's favourite topic of conversation? Because it keeps changing and we love its infinite variety. It's changed again this week from beautifully spring-like to bleakly wintry. It's not actually terribly inconvenient - the snow quickly turns to mush at this time of the year - but it is interesting and can be exciting. The beauty of the British weather is that it may well change again before long. It always does. It's as if we're married to the climate - we cherish it "for better or worse". The highs and lows of our climate are part of what we love about it. But do not be misled into thinking that every shift of the weather is the prelude to an environmental disaster. Our climate constantly changes - and, like it or not, we are always under the weather. Labour may do well in the local elections but George Galloway’s by-election win set the scene for the real Town Hall winners – apathy, indifference if not fury. But we should not let our anger at Westminster politicians blind us to the fact that the local variety make important decisions which affect us directly. Why should we trust our spooks? You can be sure they aren’t as efficient, dedicated or competent as the TV Spooks so why should we give into their claims that terrorism can only be fought if we accept closed courtrooms and digital snooping on a massive scale? The anniversary of the Falklands must serve as a reminder we should only go to war when British interests are directly under attack. Which would rule out every conflict since then and require us to quit Afghanistan before any more young people die in a lost cause. The Government seems to think its fight with tanker drivers is the 21st century equivalent of Maggie’s battle with Arthur Scargill. They’re wrong, if only because she was properly prepared for the fight and ensured that ordinary people could go about their daily business unaffected. This time there would be chaos, confusion and crisis in a matter of days. Meanwhile petrol stations are ripping us off, cashing in on the panic. Rail passengers outside London and the South East face rising fares because the Government says the capital’s commuters are unfairly discriminated against. What nonsense. If you choose to live down south, you almost certainly earn a lot more than everyone else and costly commuting is part of the price you have to pay. We must resist this attack on the regions – which will be made worse by George Osborne’s perverse plan to pay public servants less outside the south east when they should actually get more. How pathetic of the Post Office to ban deliveries to an estate in Penkridge after a postman tripped. Talk about putting the customer last. The sooner this organisation is sold and made to face the realities of commercial life, the better for everyone.